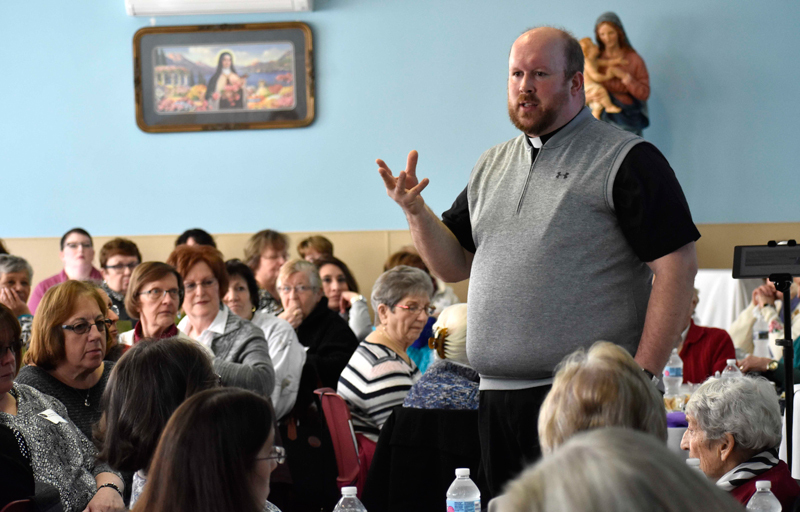 Father Hoffa was the main presenter at the Diocese of Allentown Commission for Women Lenten Retreat at the Shrine of St. Therese of Lisieux, Nesquehoning. 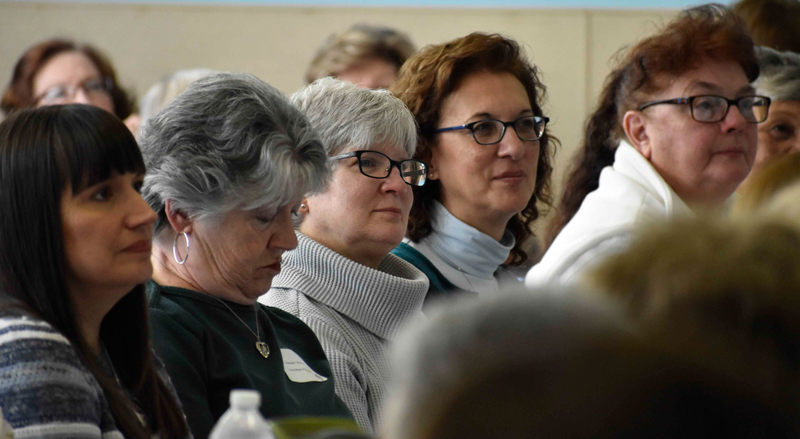 Focusing on the biblical film “The Passion of the Christ,” Father Hoffa told the women that Jesus’ suffering on the cross had a purpose and that their suffering also has a purpose. “Suffering is redemptive. Sometimes we get caught up in the struggle and think all this pain is for nothing. Never does suffering not have a purpose. Sometimes it takes us to think a little deeper and harder to find out the purpose,” he said. For example, Father Hoffa said every time a person suffers and another person offers to pray for them – their suffering is opening the door for another person to be in communion with God. “We live in a world that is so about the ‘right now.’ For each one of us there is a constant story of God unfolding in our lives,” he said. As women, Father Hoffa pointed out that they were created for many things, including affirmation, presence and tenderness. “When you encounter people who are suffering – you offer affirmation, are present to them and express tenderness,” he said. Father Hoffa then cautioned the women against taking on the role of the “fixer” and reminded them that they are not called to fix everything. “It’s a big part in you because you are good people. When we see people suffering – even if it’s ourselves – it’s time to discern the Holy Spirit, and then you will be able to accomplish the will of God,” he said. He also pointed to Mary as a model of affirmation, presence and tenderness throughout many moments witnessing her son carrying the cross to his crucifixion. “Mary teaches us suffering by who she was to Jesus at the scourging at the pillar. He was being beaten with reeds and was falling lower and lower. Just when they think he is done at the pillar – he looks and sees his mother. In that moment he is given the strength to stand up and continue going,” said Father Hoffa. Like when Mary was there for Jesus, Father Hoffa said, the Mother of God is there for all people in their times of suffering. “She comes to us in a very intimate way and offers us consolation, support and strength. Mary constantly leads us to her Son. We turn our pain over to Mary and she immediately takes it to her Son. His pain was redemptive and so is yours,” he said. Father Hoffa then asked the women to reflect on the image of the Fourth Station of the Cross, “Jesus Meets His Mother,” as it is depicted in The Passion of the Christ. “Jesus falls carrying his cross and Mary is down a ways and sees him fall. In her mind, the memory of when he fell as a little boy came back. She ran to him to offer affirmation, to be present and to give him tenderness. She runs to him again to remind him that his suffering is redemptive,” he said. 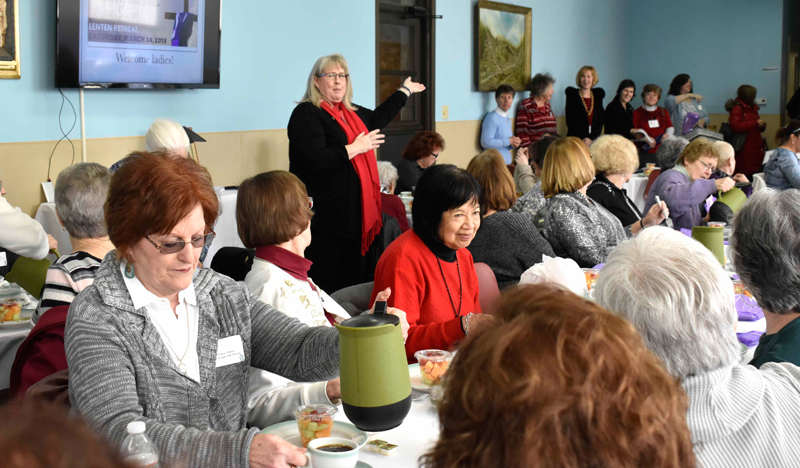 Father Hoffa then asked the women to remember a time when they experienced suffering, and to call to mind the lessons they learned and to remember the people who were there for them. “Don’t ever let your suffering become a stumbling block – remember to connect it to Jesus’ suffering. As we go into Holy Week, remember that suffering is redemptive, it has a purpose and it has merit,” he emphasized. To help them in times of suffering, Father Hoffa ended his presentation by leading the women with a devotion to Our Lady, Un-tier of Knots and asked each of them to tie their white ribbon in a knot. “When you pray, ask Mary to help you undo that knot in your life. Put the ribbon in your Bible, prayer book or on your nightstand. The process acknowledges our suffering and helps us offer them over to Our Lady, who will give them to her Son,” he said. The Lenten retreat began with Mass. The day also featured breakfast and Stations of the Cross. 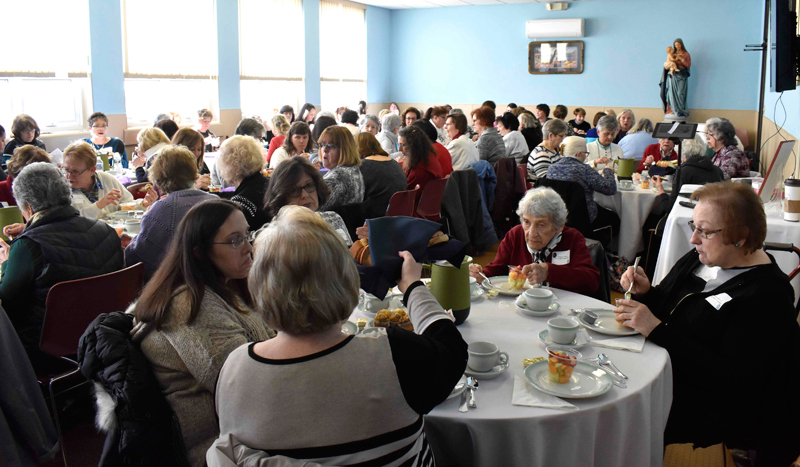 Women enjoy breakfast at the Lenten retreat. Father Hoffa discusses the suffering Mary endured while witnessing the road to Jesus’ crucifixion, and asks the women to reflect on their personal sufferings. Women listen during the main presentation.